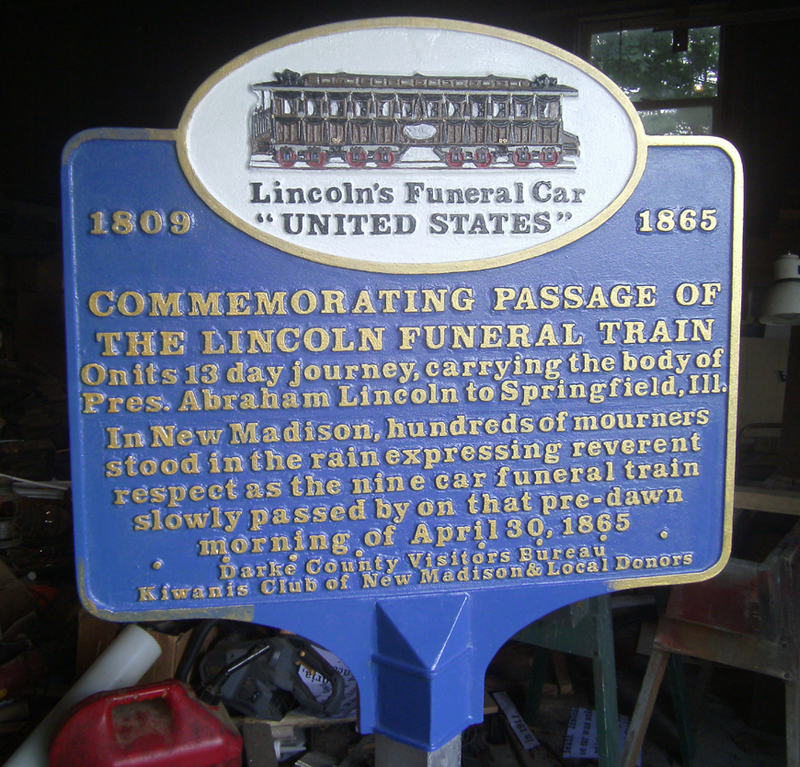 GREENVILLE, OH – A historical marker commemorating the passage of the Lincoln Funeral Train through Darke County will be installed in New Madison this Fourth of July. The marker will signify the passage of the body of President Abraham Lincoln through New Madison, who was assassinated on April 15th, 1865. The route of Lincoln’s funeral train cut a path through Darke County on its trip to Lincoln’s final resting place in Springfield, IL. The train passed through New Madison on the morning of April 30th, 1865. Near 2 AM, hundreds of mourners gathered in New Madison to see the train slowly pass by. Mourners knelt with their heads bowed, some prayed, and others sang hymns. The train then continued on into Indiana. The fabrication of the marker pattern took about five months, and all the letters on the marker are hand-cut. It took three people to pour the molten metal into the mold, which weighs 800 pounds. It took roughly forty hours to hand-paint the marker. 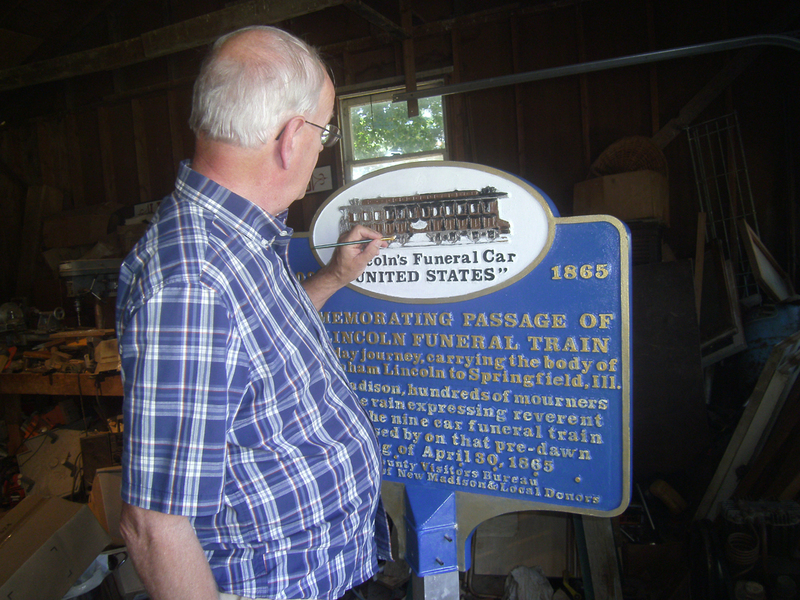 It will be the first of four Lincoln funeral train markers to be installed in Darke and Miami counties. A dedication ceremony of the marker will be held at 2PM, July 4th, at the New Madison Public Library. The public is cordially invited. 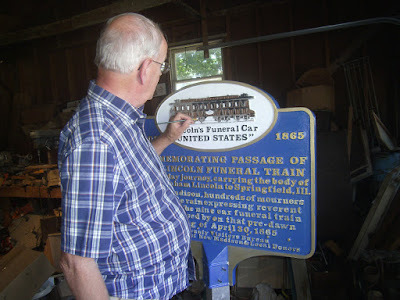 Local historian Scott Trostel, who was intimately involved with the project and the fabrication of the marker, will give a brief presentation on the history of the funeral train during the ceremony. For more information on the Darke County Visitors Bureau, visit them online at www.visitdarkecounty.org.